So, steampunk – compared to other genres, haven’t read much of it really. But it’s cool, I find I’m really liking it. So, this collection of novellas was an interesting read. 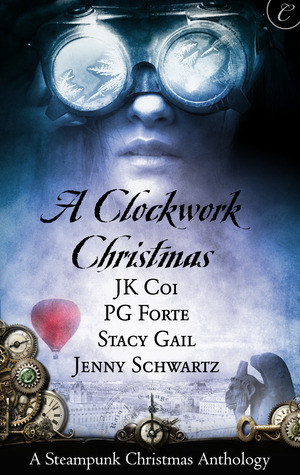 Of the four titles, Crime Wave in a Corset by Stacy Gail , This Winter Heart by PG Forte, Wanted: One Scoundrel by Jenny Schwartz, Far From Broken JK Coi, I really loved the first one. We’re talking really loved it, like a 5 butterflies rating. The second story was cool too, liked it a lot, that would be a 4 butterflies rating; the last 2, while I liked them as well, were more of a 3 butterflies each. So, the overall rating is…*does the math*…4 butterflies. The stories themselves were all very beautiful and touching, each story had a different steampunk feel to it and I loved the diversity. They all had another thing in common, aside the steampunk theme, and the emotional, touching stories: a great writing style, a bit traditional and conservative – in tone with the time-frame of the novellas-and I loved it to bits. I really really did. Beautiful writing in each of them, careful wording and attentive structure, just beautiful. As far as characters go, I loved the main couple in Crime Wave in a Corset, I loved them each and I loved their chemistry. Though the tone of writing is a tad conservative and sort of old-school, this story was undeniably fun and the the characters were charismatic and charming. Being a very character-oriented reader, it makes sense that this would be my absolute favorite of the collection. The characters in the second story, This Winter Heart, felt a bit more uptight and considerably less charming from my perspective, but I loved the idea of the story so much I would have enjoyed it even if I’d have hated the characters, which of course I didn’t, I just wasn’t crazy about either of them. The third story, Wanted: One Scoundrel, brings forth this spunky sort of heroine, and the guy is enjoyable too, I just didn’t go with the flow as much as with the others honestly. It had a lighter tone, and the characters were entertaining and had interesting chemistry, and would I have read the story on its own I’m quite sure I would have probably rated it one butterfly higher, but coming in after the first two did it a disservice in my opinion.